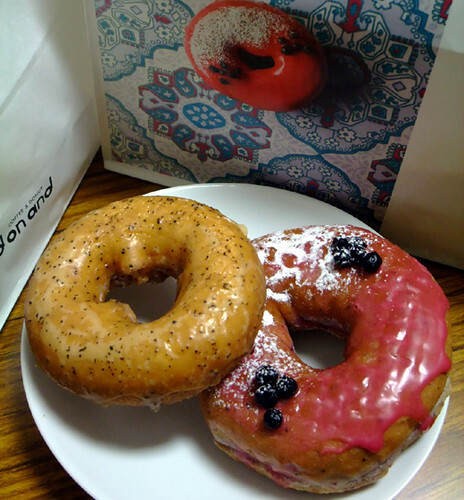 I like their blueberry cheese donut (slightly sweet cream cheese are filled in) and lemon tea donut (sugar glaze coat with real lemon tea leaf)! “Green Island” is a photo processing project. 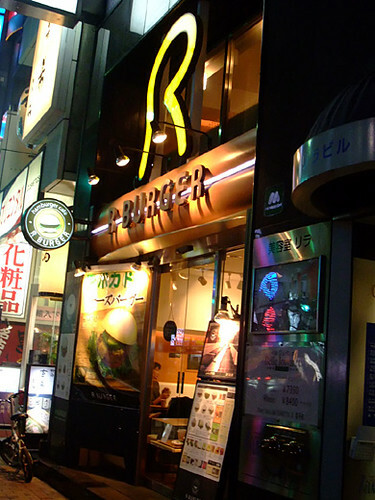 This concept is that if road of Tokyo were lawn. Their thought is that we can’t plant and dig a well but we can imagine. the car is not kawaii, but one of the most cool vehicle! 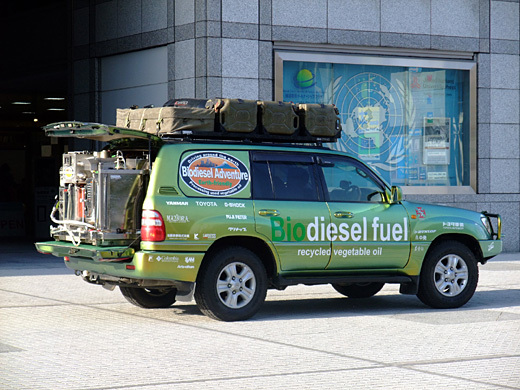 it was powered by used cooking oil… the oil become biodiesel fuel. 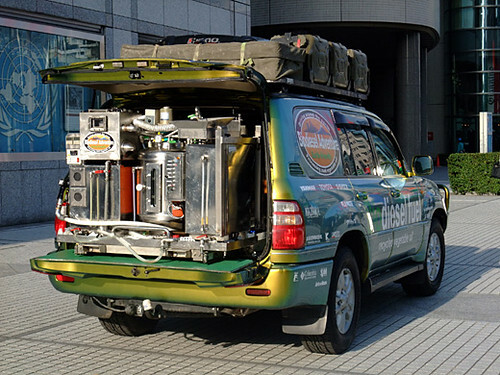 the car finished its drive, all around the world! 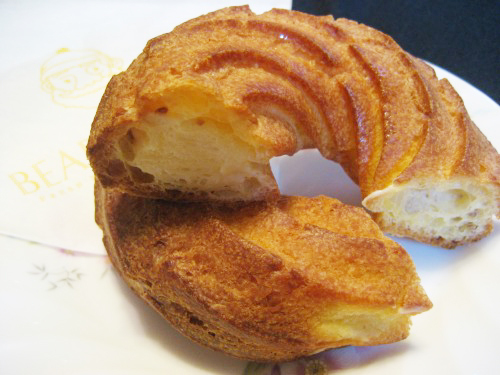 they use Chinese buns, and use Japanese seasonings or spices. 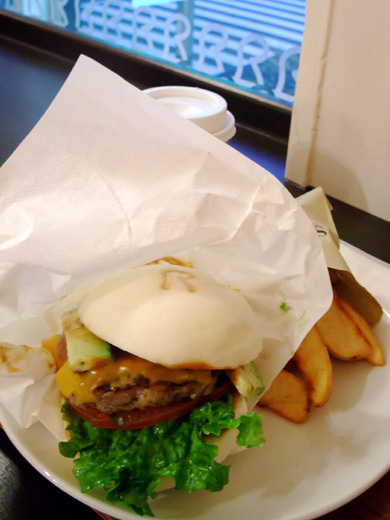 almost of all patties are made from chicken, tofu, or pork. ginger flavor in demiglace sauce. 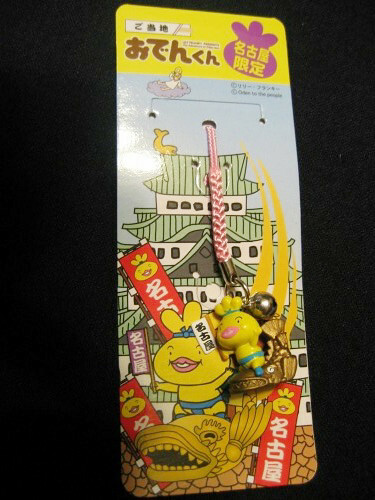 “ODEN KUN” Charm Mascots are limited to a special area( Tokyo,Nagoya,Hokkaidou..). 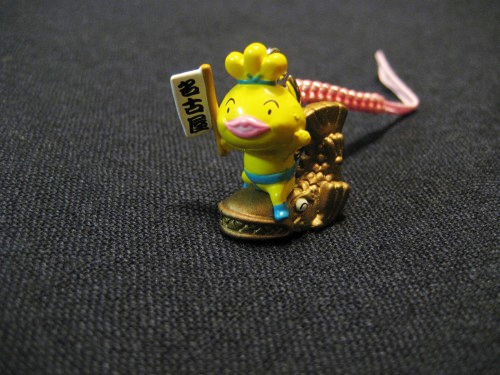 This is a “ODEN KUN” Charm Mascot from Nagoya. He is riding on a golden shachihoko statue from the top of Nagoya Castle!! 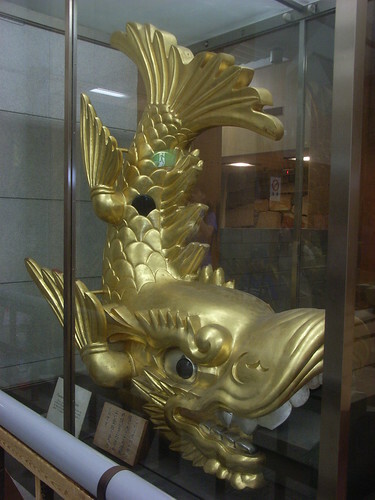 Shachihoko is a Japanese sea monster that has the head of a tiger and the body of a fish. It was believed that this animal could cause the rain to fall, and as such, temples and castles were often adorned with Japanese ornamental tiles in this shape, in order to protect them from fire. 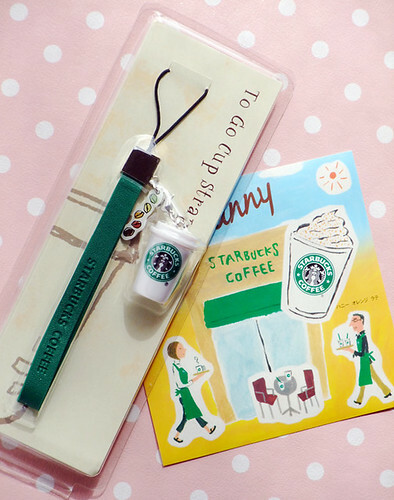 the latest one is green leather strap with a plastic “to go cup” miniature. Oden-kun and his pals are all types of oden ingredients such as eggs, fish paste, burdock, white radish, devils tongue and so forth. 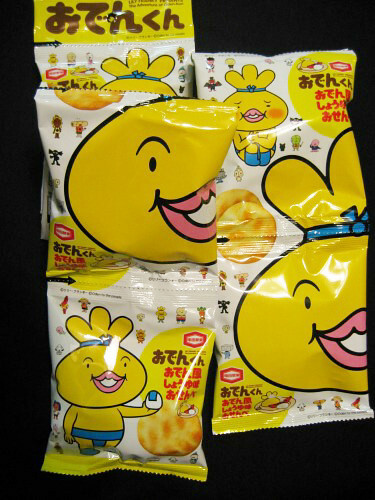 Oden-kun himself is a loincloth-clad, headband-wearing piece of mochi kinchaku, – rice cake stuffed in fried tofu pouch. 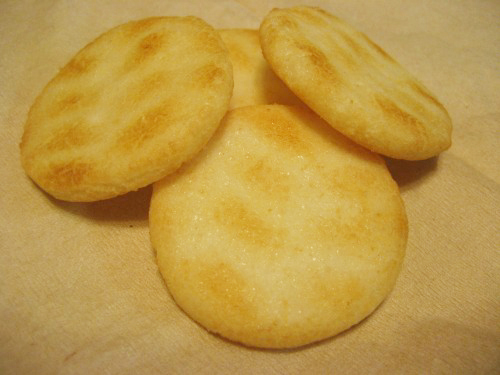 These are oden taste senbei(rice cracker) in small quantity. 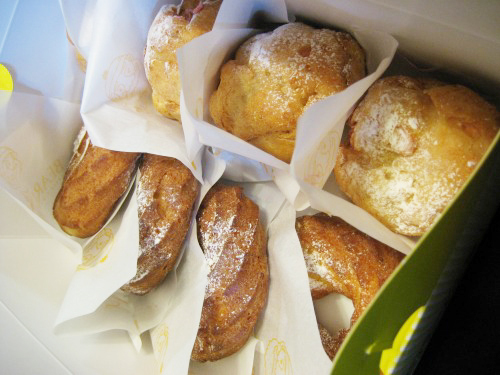 It’s a nice size for me not to overeat. 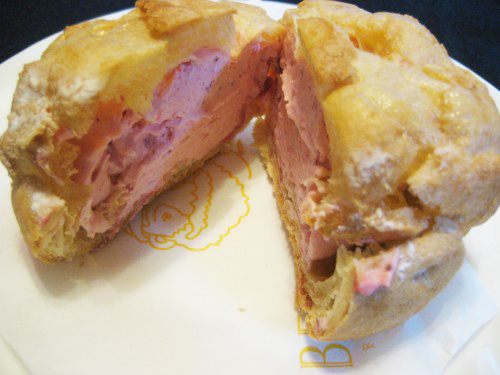 A crunchy puff pastry filled with fresh and all natural strawberry cream which is the limited time offer. Another ones are reflecting the image of wheel. Yammy! !